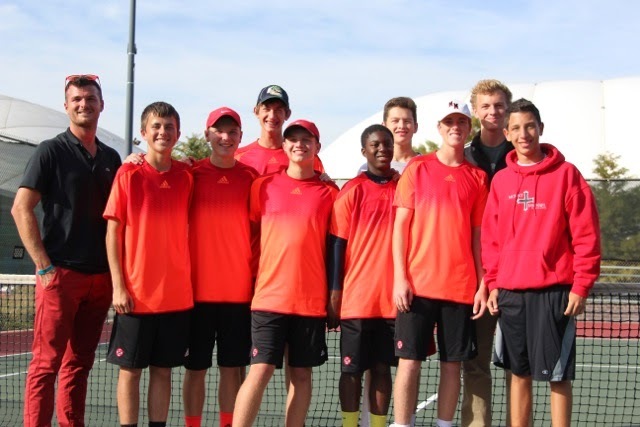 The Mount Michael tennis team put in a good performance at the state meet finishing in 5th place. Both doubles teams made it to the semi finals with the #2 doubles team of Luke Krajewski & Alex Stoupa finishing in third place. With only one senior on the state team the Knights are already looking forward to next fall. Coach Chase Petersen, Alex Stoupa, Luke Krajewski, Alex Hotovy, Logan Baumberger, Matt Amao, Ray Dorsey, Jack Hitzemann, Harrison Hohman, and Lorcan Jamal.